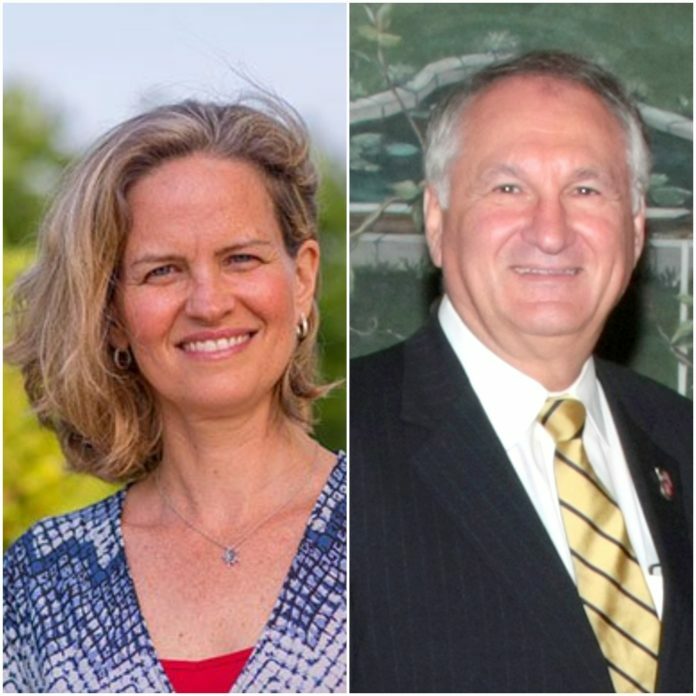 Laura Curran and George Maragos will face off in the Sept. 12 Democratic primary for Nassau County executive. Laura Curran continues to outstrip George Maragos in campaign fundraising and spending as he maintains his big cash advantage in the Democratic primary for Nassau County executive, new filings show. Curran, a county legislator, had $445,492 on hand after spending $188,580 — more than three times the $57,410 she raised — from July 13 to Aug. 7, according to her report filed Friday with the state Board of Elections 32 days ahead of the Sept. 12 primary. Maragos, the county comptroller, raised no money but still had more than $1.2 million on hand after spending $12,203. Maragos has loaned his campaign more than $1.4 million. Curran, the choice of the Nassau County Democratic Committee, has raised more than $1 million since launching her campaign in November. She has spent heavily in the past month on staff, campaign literature and consulting, including more than $57,000 in polling services. “Nassau residents are ready to give our County the fresh start it deserves, and for the real change my campaign is offering,” Curran said in a statement. Some $15,000 of the money Curran raised in the past month came from other political committees. The Town of Oyster Bay Democratic Committee transferred $10,000 to Curran’s campaign; and the committees for two Democratic county Legislature candidates — Jeff Gold and Eileen Napolitano — each gave her $2,500. The bulk of Maragos’ spending was on campaign consulting and literature. His filing shows no payments for wages to dedicated campaign staff, while Curran’s filing listed 11 paid staffers. Maragos, a former Republican who switched parties in September, reimbursed himself $2,145 for literature that he paid for up front, his filing shows. “The race for county executive should not be about who spends more but who is best qualified to make Nassau County affordable by lowering property taxes, building more affordable housing and improving public transit,” Maragos said in a statement. Former state Sen. Jack Martins, the Republican candidate for county executive, did not have to file campaign finance reports Friday because he does not face a primary. The three candidates are vying to replace Edward Mangano, the sitting Republican county executive who was indicted on federal corruption charges last fall. Mangano failed to get on the ballot with an established political party and did not have to file a campaign finance report.